Thanksgiving is fast approaching and the Holiday Season is upon us…families are traveling in vast numbers to their relatives for dinner and holiday parties. I think it’s safe to say that we’ve all been there: somewhere between a place where it’s either not ideal or you simply cannot spend the night and almost too tired to drive? It’s a dangerous place to be! 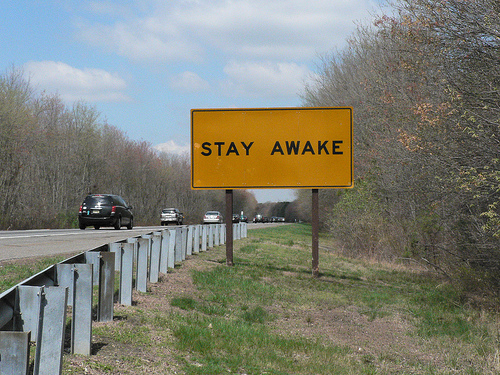 If you’re too tired, don’t drive! The National Highway Traffic Safety Administration estimates that drowsy driving results in 1,550 deaths, 71,000 injuries and more than 100,000 accidents each year. Seems to me this can be a cause for increasing Massachusetts car insurance premiums. The AAA Foundation for Traffic Safety analysis of the accidents resulting from drivers falling asleep behind the wheels is cause for alarm and concern. According to the study, younger drivers age 16-24 were nearly twice as likely to be involved in a drowsy driving crash as drivers age 40-59, and about 57 percent of drowsy driving crashes involved the driver drifting into other lanes or even off the road. * Get a good night’s sleep before you hit the road. driving at night or without stopping for breaks. the warning signs of fatigue. drivers, or going for a walk. * Consume caffeine. The equivalent of two cups of coffee can increase alsertness for several hours. For more information on this topic visit our website at http://www.koinsurance.com or visit the National Sleep Foundation’s drowsy driving website. Does your auto policy cover a rental car when traveling?? Thoughts of winter coming have people thinking about their winter travel plans….some things to think about when renting a car. Where you travel, the vehicle rented, the rental contract and other factors can all impact coverage, so it really depends on the situation. Below is a general overview, as it relates to a Massachusetts Auto Policy (MAP), of issues to consider. A MAP is not worldwide. It only covers you in the U.S., it’s territories, Puerto Rico and Canada. As long as you have comprehensive and collision coverages on any of your own vehicles, it would cover physical damage to the rental car. Some rental companies limit where a vehicle can be operated. Driving the car beyond these limitations violates the contract, and your insurance would not cover. Most rental agencies require all drivers to be listed and paid for at time of rental. If you allow anyone else to drive and there is an accident, there is no coverage. Most rentals consider the rental contract void if driving under the influence. This also voids coverage. MAP excludes “regular use” of another vehicle. If you rent for an extended period, it’s best to check with your insurance company. To avoid this issue, you can add a “Use of Other Autos” endorsement for the rental period and then have it removed. Many rental companies often require the auto to be replaced with a new one if a total loss occurs. The MAP only pays for Actual Cash Value not Replacement Cost, which is something to consider. If you damage a car and it can’t be rented to others, the rental agency may expect you to pay for lost rental time. Loss of use is not covered by a MAP. The Collision Damage Waiver (CDW) offered by the rental company can be a solution for situations not covered by your auto policy. However, you should never assume that the CDW absolves you of all issues. Always read the contract and clearly understand what is and what is not covered. Also, if you rent a car using a credit card that offers some type of insurance protection, be sure to read the contract and understand coverage limitations. If you’re planning to rent a car, our office is always glad to review specifics of your auto policy protection. However, it’s ultimately your responsibility to understand the terms and requirements of the rental contract and determine if your policy provides the coverage you need. You are currently browsing the Koinsurance's Blog blog archives for November, 2010.